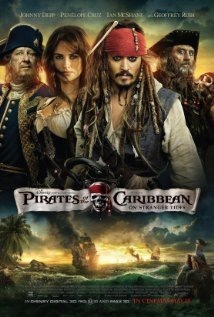 The 4th movie, in what may people wrongly believed to be a trilogy, Pirates of the Caribbean: On Stranger Tides was surprisingly quite good. My expectations for the movie were very low going into it as there have been few instances of franchises that can make it this far without completely selling themselves out into misery. This movie was unnecessary in terms of adding to the on-going plot of the franchise, however, it now seems clear to me that Disney wants to continue Pirates as an on-going series of somewhat unrelated adventures. At the end they even create the opportunity to make a 5th. 1. It doesn’t seem like a complete money grab. Sometimes a franchise will sell its rights to the highest bidder so you end up with a product made by a random 3rd party. In this case though, the integrity has been largely maintained. Although some of the actors no longer return (namely, the lovely Keira Knightley and her male counterpart Orlando Bloom) Johnny Depp and Geoffrey Rush do and they are able to keep the originality alive. 2. The franchise now seems to be taking a turn towards somewhat un-related yet epic adventures. This is okay with me because it largely resembles a James Bond-style approach to a franchise. Instead of trying to continue to build a story-line outwards (or, now very frequently, backwards with prequels) you can create a series of “mini-stories”. This approach is very effective for big-budget Hollywood movies. Much more effective than trying to force an on-going story line for a large number of sequels and prequels. All in all, the movie was very fun and I hope to see at least a couple more Pirates movies. As long as they keep Depp at the helm and maintain the series integrity by creating epic short stories, you will always find me in the theatres watching them. Next postDoes Technology Make Life Better (The World A Better Place)?